We haven’t tried this yet, but it sounds delicious! Due to some food allergies my husband can’t have the typical cocktail sauce or garlic butter that usually accompanies shrimp. The first time he ate plain shrimp it was pretty sad, so the next time we sautéed onions with it and that helped. 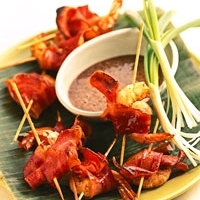 This bacon wrapped shrimp sounds like it could be really good too! You have to be creative when your list of food allergies is a page long! Heat your grill to med-high. Half cook the bacon on the stove, microwave, or broil for a few minutes. Cut it just long enough to wrap bacon. Spear from tail to head and put 4-6 on a skewer leaving small gaps between each.